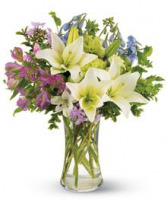 Fill To Value, White Lily, Alstromariea, Blur Delph, Mini Green Hydrangea, Greenery. Sending a beautiful thought of spring will put a warn sunny smile on her face. 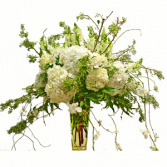 Sm Size, Hydrangea, Snaps, White Rose, And Vine, Lg Size, Hydrangea, Snaps, Roses, Spray Orchids, Vine. 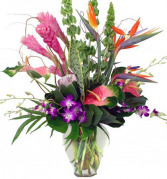 Fill To Value, Pink Ginger, Birds Of Paradise, Anthurium, Purple Dendron Orchids, Bells. 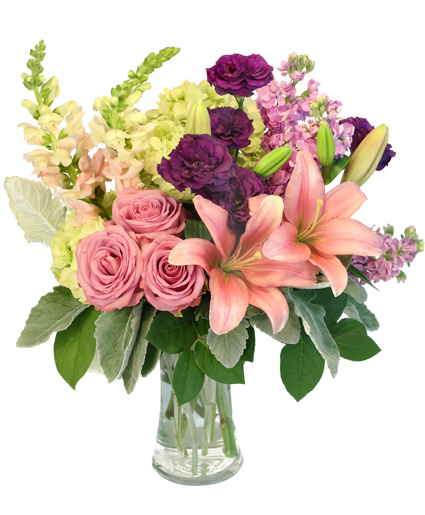 Feel like you on a tropical Island with this beautiful mix of Ginger, Birds of Paradise, Purple orchids, Anthurium and Green bells.